Toyota has pushed the boat out with the new 2019 Avalon, both figuratively and literally. The last four generations of Avalon could easily be described as boat-like: big, uninspiring, and fairly wallowy sedans that struggled to make a dent in your memory. This new car, though, isn’t willing to share the same fate, and Toyota has raided both its design studio and its tech labs to make sure of it. There are two distinct styles, part of Toyota’s attempt to welcome younger drivers into the Avalon fold. The Premium and Hybrid models take a more traditional approach to design, with sizable chrome grilles at the front. The Sport XSE V6 and Touring V6 models, however, get a more aggressive look, with blacked-out grilles and quad tailpipes. “Young” is, of course, subjective. In fact the current average Avalon buyer is 64 years old, and Toyota is setting itself a not-inconsiderable challenge given the market’s current penchant for crossovers and SUVs. The primary target is would-be Nissan Maxima buyers, though Buick’s LaCrosse and Chrysler’s 300 are also in the crosshairs. To do it, Toyota has turned to an all-new platform, lashings of tech, and the sort of luxury treatment you might have once needed to buy a Lexus GS to attain. The former is the TNGA K platform for sedans, shared with the well-received Camry. It leaves the car longer, wider, and lower, but with shorter overhangs and a lengthened wheelbase. As for the style, it’s only really when you see it next to the old Avalon that the step forward really stands out. Much as with the Camry, the result is more youthful and modern, even if it’s not going to be to everybody’s tastes. The Sport models’ grille in particular is going to prove divisive; it’s very color-dependent, with darker paints leaving the whole thing looking a little more gaping than glamorous. Still, with pricing kicking off at $35,500 (plus $895 destination) Toyota has been aggressive in just what you get in the car. LED lamps are standard, front and rear, along with a 9-inch touchscreen infotainment system with Apple CarPlay and Amazon Alexa. A 7-inch driver information display is included on all trims, together with dual zone automatic climate control, ten airbags, blind-spot monitoring with rear cross-traffic alerts, and an electronic parking brake with brake-hold. 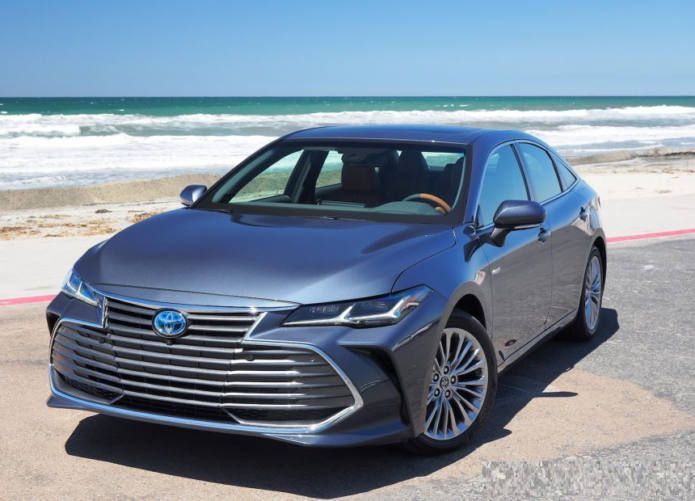 Considering Toyota has been – rightly – criticized in recent years for its backward infotainment system, there are some notable improvements in the 2019 Avalon. The smartphone projection systems are certainly welcome, as are the five USB ports (three up front, two in the rear). Qi wireless charging is standard on all but the base trims; the Limited and Touring trims have a 10-inch head-up display. I still can’t say I’m a huge fan of Entune, Toyota’s newest infotainment system, even in 3.0 form as on the Avalon. Its UI has been revamped so that it’s less confusing, but its graphics and menu structure can still look and feel dated, and there’s noticeable lag at times. No Android Auto, either. Still, check off the 1,200 watt JBL Clari-Fi audio system and its sweet-sounding fourteen speakers might help you forget. Then there’s safety. Toyota Safety System Plus (TSS-P) is standard across every trim, and that includes a pre-collision system with pedestrian detection, lane departure alerts with steering assistance, full-speed adaptive cruise control, and automatic high beams. A bird’s eye camera, parking sensors, and rear cross-traffic automatic braking are optional. Toyota’s 3.5-liter V6 offers 301 horsepower and 267 lb-ft of torque; it’s paired with an 8-speed automatic with paddle-shifters. Adaptive variable suspension – a first for the automaker – is an option, capable of adjusting the damping force across 650 levels every 20ms. EPA numbers aren’t confirmed yet, but Toyota is expecting around 22 mpg in the city, 32 mpg on the highway, and 26 mpg combined for the highest XLE. The one most will probably end up for will see its highway figure drop a point. Pointed in a straight line, and the Avalon V6 cruises with the best of them. It’s a smooth ride and a quiet one – another notable improvement over the last-gen car is the addition of a lot more noise isolation material – and even in Sport S+ mode it’s still easy and relaxed to drive. Perhaps a little too easy, in fact. There’s a little uncertainty around the steering dead-center, and if you’re coaxed by the Engine Sound Enhancement and sport sound-tuned exhaust, both standard on the Touring and available on the XSE V6, to push into the corners, the Avalon has a tendency to skittishness around the rear wheels. Nobody, of course, is going to buy an Avalon for its sporting prowess. With that in mind, the Avalon Hybrid arguably makes more sense both on paper and from behind the wheel. It pairs a 2.5-liter Dynamic Force four-cylinder engine with electric drive, for a total of 215 horsepower. Unlike the automatic in the V6, there’s a CVT with fake gears in its manual mode. It’s a cleverly packaged hybrid, certainly. Toyota has stashed the NiMH battery under the rear seats, meaning both versions have the same roughly sixteen cubic feet of trunk space. However, it’s markedly more efficient: EPA ratings are expected to be 43 mpg in the city, 44 mpg on the highway, and 44 mpg combined. Factor in the smooth pick-up from a standstill courtesy of that electric drive and, despite the lower overall horsepower, it’s the powertrain that suits the Avalon far more than the gas-only engine. You won’t get much all-electric range, mind, even if you hit the EV button. Beyond around 30 mph the gas engine kicks in automatically, assuming you haven’t been too heavy with the accelerator before that point. Arguably best of all, though, is the fact that the 2019 Avalon Hybrid is much more affordable than its predecessor: only a $1k premium over the V6, versus $2k for the 2018 car. It’s fair to say the old Avalon – no matter the generation – wasn’t especially memorable. Toyota designed and built the car with an American audience in mind, but it’s taken five generations for that process to acknowledge drivers might have an appetite for more than just the automotive equivalent of a “premium” microwave meal. In contrast, thoughtful features and flourishes abound in the 2019 Avalon. The cupholder with a flattened edge, for instance, because Toyota knows you’re just as likely to stand your smartphone up in there as you are to use if for a takeaway coffee. The fact that all the USB ports deliver 2.1A for swifter charging than is the automotive norm. The groove in the rear armrest that you could prop an iPad up in. It’s about the real Yamaha wood with its open pore finish, and the metal accents that you find in certain trims. The unusual perforated leather on certain trims, that’s leagues away from anything you’ll find in Toyota’s other cars in terms of quality and visual interest. The adaptive LED cornering lamps, which light up when you’re turning to extend the foreground illumination by around 60-percent, but with no moving parts. Or the standard smartwatch integration, allowing you to remotely lock, start, locate, and check the fuel levels of your shiny new Avalon. Indeed, considering what you get the pricing is astonishing. The XLE V6 starts at $35,500, then there’s the XSE V6 at $38,00, the Limited V6 at $31,800, and the Touring V6 at $42,200. On the Hybrid side, the XLE HV starts at $36,500, then the XSE HV at $39,00, and the Limited HV at $42,800. I suspect the 2019 Avalon will go down well with Toyota’s existing clientele. It’s sleeker than its predecessor, more spacious, more refined, you get more standard kit, and the styling has finally become memorable. As for coopting new members of the Avalon tribe, Toyota’s main problem isn’t going to be the car itself, it’s getting people to even consider it in the first place. The 2019 Avalon is a significant step forward in all the ways that matter from the car that came before it. Now it needs to figure out how to get that message out there.